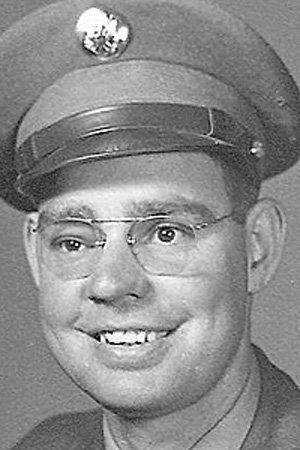 Obituary – Steichen, Edward Nicholas « Perry High School Alumni Association, Inc.
Edward Nicholas Steichen was born on March 19, 1925 in Perry, OK to Nicholas and Rose (Rolling) Steichen. He grew up and attended school at Pleasant Hill, later graduating from Perry High School. Ed was drafted in 1951 to serve in the United States Army during the Korean Conflict. Mr. Steichen served his country for 22 years retiring as a Master Sergeant in 1985. His hobbies included; carpentry, traveling and playing cards. Mr. Steichen, age 84, passed from this life to be with his Lord and Savior on August 26, 2009 at the Perry Memorial Hospital. A Wake will be held at 7:00 p.m. Friday, August 28, 2009 at the Perry Funeral Home Chapel. A Mass of Christian Burial will be at 10:00 a.m. Saturday, August 29, 2009 at the St. Rose of Lima Catholic Church with Father Tom Dowdell officiating. Interment will be in the St. Rose of Lima Cemetery. He is survived by 3 sisters, Lucille Schultz and husband Pete of Billings, OK, Luella Cink of Enid, OK, and Delores Quinn of San Antonio, TX and many nieces, nephews and friends. He was preceded in death by: his parents, 1st wife, Betty Jeannie (Smith) and 2nd wife, Helen Louise (James) and 1 sister; Katherine Steichen.